At CS Storage, we supply storage solutions and products for the workplace at the best prices and with great customer service. 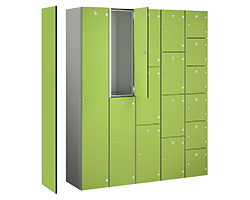 Our selection of lockers includes school lockers, wet room lockers and any other kind of locker you can think of. In addition, we supply steel cabinets, tool cabinets. cycle shelters, steps and ladders (EN-131 and GS Approved), shelving, racking, locks, padlocks and all other storage solutions for the workplace, schools, office and leisure centres.